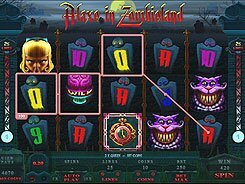 A creepy Franken Cash slot is inspired by horror films and stories. 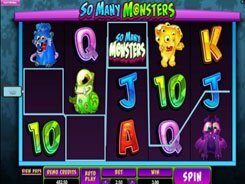 Find your way into the lab of the Mad Scientist and steal a monster jackpot. 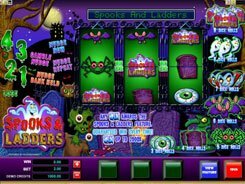 This five-reel 20-payline slot machine features towers, monsters, windmills, lab rats and other spine chilling icons. 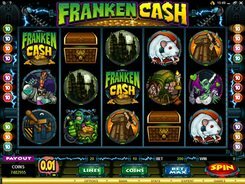 Bet up to $10 per each line and push the Spin button to start your journey to Franken’s castle. The highest paying symbol is Franken Cash awarding 2500 coins for five of a kind. 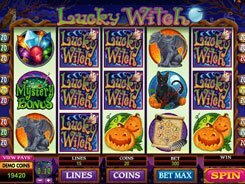 The slot has no wild symbols, but a lack of wilds is offset by two scatters in place. 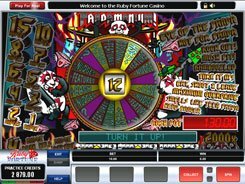 3+ Switch symbols scattered on consecutive reels starting from the leftmost reel trigger 15 free games with a x2 multiplier. Another scatter symbol is represented by the Electric Chair, with two of them activating the Electrifying Bonus Feature. 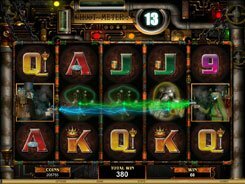 In this bonus game you pick three out of twelve voltage meters to be awarded random multipliers. PLAY FOR REAL MONEY!